Intel today unveiled the Intel® Solid State Drive (SSD) DC P3608 Series, its highest performing SSD for the Data Center to eliminate bottlenecks in HPC workflows, accelerate databases, and gain business insights through real time analytics. Intel is already shipping the Intel® SSD DC P3608 Series in high volume to top OEMs, including Cray, who issued the following statement. The Intel® SSD DC P3608 Series delivers high-performance and low latency with NVMe and 8 lanes of PCIe 3.0. Here is an example of a study Intel is conducting on a database application. 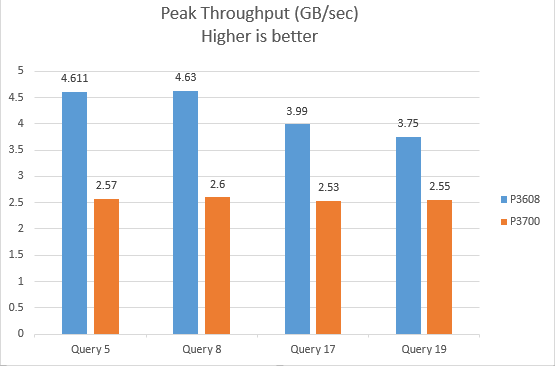 One thing most DBA’s know that is that column-based us better than row-based when it comes to index compression efficiency and much less IO on disk. Pulling together much faster analytics queries against very large databases into the Terabyte class. These indexes are extremely efficient. Well does this all pair well with better hardware? The answer is yes. Better hardware always matters just like better engineering wins in automotive, for safety, efficiency and fun to drive. The same is true with NVMe technology which is standards based PCIe Solid State Drive technology. NVMe-based SSDs are the only kind of PCIe based SSD that Intel provides. We did a lot to invent it. Is it fun to run very large TPC-H like queries against this type of drive? Well let me show you. Here is some data that we put together where we show the Maximum Throughput of our new x8 P3608 against our best x4 card, the P3700. 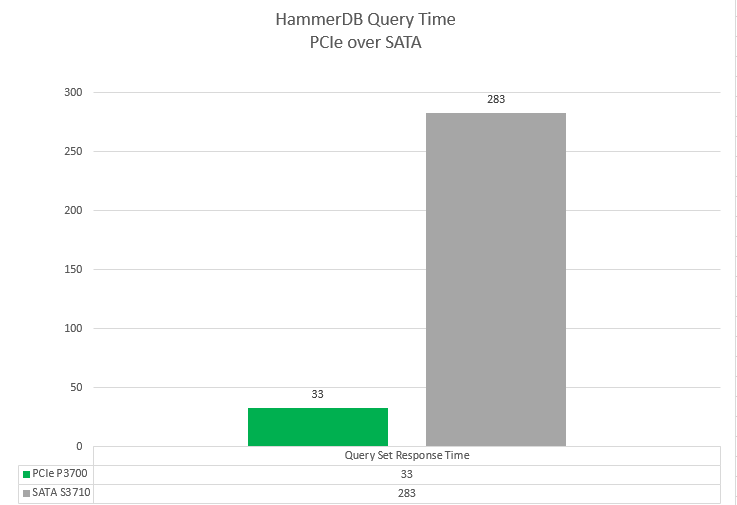 Also to put this into perspective I share the SATA versus PCIe run time of the entire 22 queries that exist within the TPC-H specification that is within HammerDB. At the bottom of the blog is the link to the entire data sheet of our testing. PCIe x8 and 4TB's of usable capacity from Intel is now here. On September 23, 2015 we have released the new P3608. So how many Terabytes of SQL Server Warehouse you want to deploy with this technology? With 4 x8 cards, and 16TB, you'd be able to support over 40TB of compressed SQL Server data using the Fast Track Data Warehouse architectures, because of the excellent compression available with this architecture. Here's the data comparing our new x8 and x4 Intel PCIe drives and giving you some perspective on how much faster PCIe is over SATA, I am including a graph of the entire suite of queries on PCIe (P3700) over SATA. (S3710). Here we compare the P3608 to the P3700 for maximum throughput. 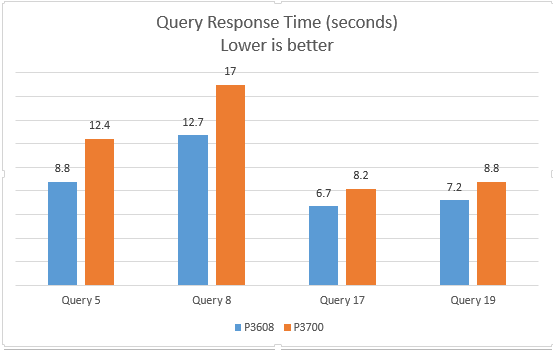 Here we compare the P3608 versus the P3700 for query time on the most IO intensive queries. Finally to give you some perspective here is what a SATA drive could do with this kind of SQL Server Database. This graph consists of all 22 queries , not just the IO intensive ones as above, and it's the total time to run all queries within HammerDB.